Recommended to: Readers who love stories filled with magic and brave heroes/heroines. Thirteen-year-old Chase Tinker can't understand why he has the power to move things with his mind. Besides that, his dad has been missing for over a year, causing his mom to be too upset to pay much attention to her sons, so now he's been busted for shoplifting. As if this isn't enough to worry about, his younger brother Andy suddenly has a weird magical ability too. Can things get any crazier? Chase thinks. Then, a grandfather they thought to be long dead arrives at their door. He wants Chase and Andy to come visit him so they can learn about their supernatural heritage, and why they have magical powers in the first place. Ah, to live in a world filled with magic. The one escape that I'll never get too old for is one to a magical place! Trust me. Reading Chase Tinker and the House of Magic spoke to the little kid who still shelters inside me. I've said it before, and I'll say it again, I love Middle Grade books. Books with child heroes, perfectly evil villains, and just the right amount of whimsy tend to capture my heart. So I was very much looking forward to seeing where Chase Tinker's story would lead me. Chase is a fabulous main character, and one that I see all readers warming to. He's this perfect mix of funny, awkward, and brave. Younger readers will probably see a little bit of themselves in Chase. He squabbles with his brother Andy, but is also fiercely protective of him. He's brave when he needs to be, but also makes rash decisions sometimes. In other words? Chase is a normal kid. With crazy emotions, adorable crushes, and the want to be a man before his time. He's relatable, and fun to follow. In fact each and every character in Chase Tinker and the House of Magic comes alive on the page. I was introduced to the Tinker family a bit at a time, and I found myself adoring each and every person presented to me. Well, except for the villains of our story, of course. They were also well done, in that they came across as just what they were meant to be: undeniably evil. The Marlowes give the Tinkers something to fight against, and that's where all the magic really becomes a vital part of the story. Oh, and the house! I could gush on and on about the titular home filled with magic. With rooms full of the most interesting powers imaginable, I'd be perfectly content to do nothing but read about Chase and his friends exploring this amazing place. I refuse to spoil even a minute of that for potential readers. I'll honestly say that it was my favorite part of the read. I loved getting lost in the Tinker's home, and I'll happily go back. That, and the ending absolutely has me wanting more. 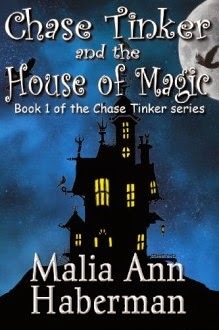 So if you're looking for a book for your budding reader, or even a read for yourself to get lost in, I'd suggest picking up Chase Tinker and the House of Magic. It's definitely a fun place to spend a few hours getting lost in!